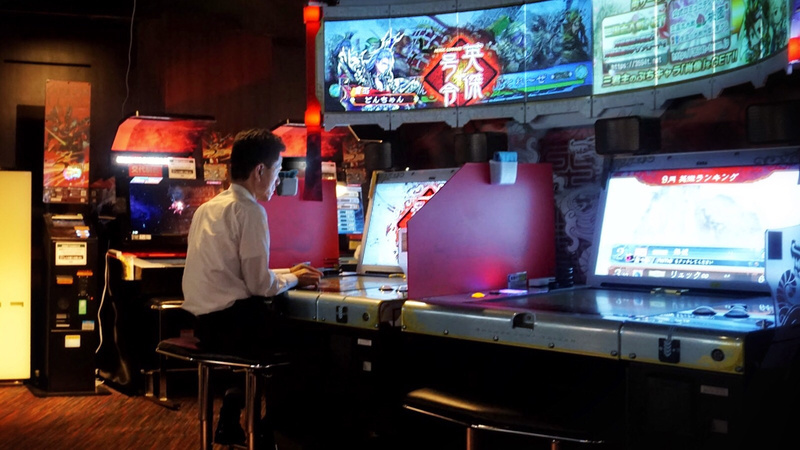 Tourists dropping in on Japan’s arcades are often surprised. Western arcades have stuck to a familiar trajectory, running last-decade machines form last-century franchises: OutRun 2, After Burner Climax, Time Crisis 4…. The games we’re used to are easygoing, fun and friendly, with a warm welcome and a wave goodbye. It’s not like that in Japan. Arcade games out there are the fruits of a different branch of the family tree – odd characters by any account. 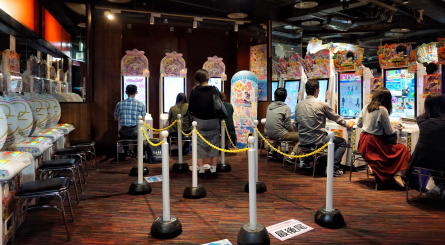 Japan’s arcade games are awkward little so-and-sos who seem to go out of their way to confound you. Gunslinger Stratos is a team-based, nationally-networked, third-person shooter; very complex, requiring twin sticks and dual lightguns. 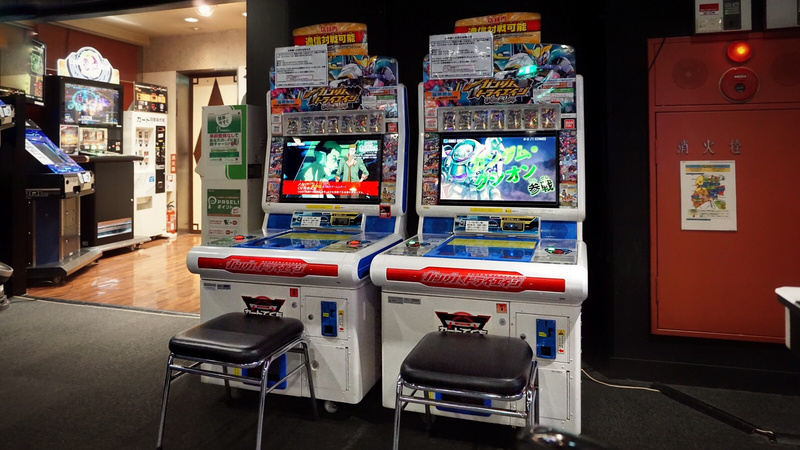 Gundam: Bonds of the Battlefield presents levers, buttons and pedals in a sit-in private-booth with spherical-projection screen for mecha deathmatches using headset communicators. Unlike our good old friends – pals since the '90s – Japanese games have become demanding and obtuse, and expect serious commitment from the player, not a casual "Well, I have some time and change to spare" approach. But of all these stubbornly inscrutable individuals, nobody is harder to get to know than the Trading Card Games – the 'TCGs'. 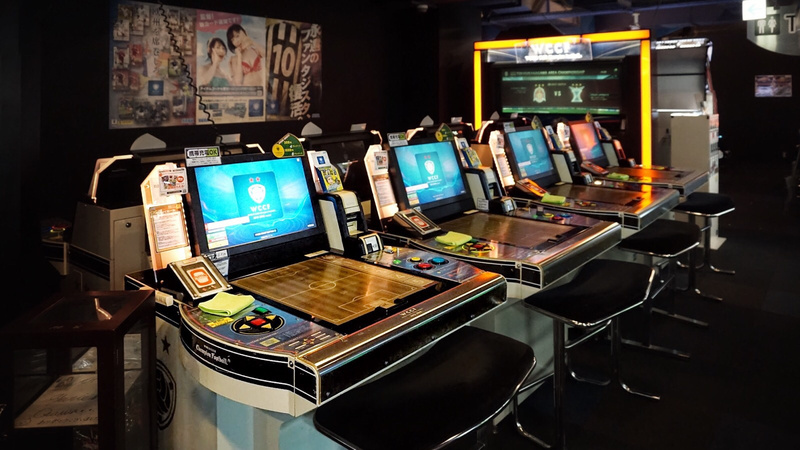 Despite their standoffishness, though, when we actually sit down with some TCGs, they told us about a secret link connecting most of the arcade games in Tokyo. Allow us to explain. In order to inspire repeat play, many Japanese arcade games have a collectibles mechanic of some kind. For instance, Sega's Border Break – an online team battle mecha game which has been running since 2009 – has a massive catalogue (a literal, fat paper catalogue) of character accessories to choose from. Now, Border Break isn’t a TCG, but we can imagine it being at the most video gamey end of something we’ll call the 'collectibles spectrum'. At the other end of that spectrum would be something that is 100% pure collectibles – like the famous gashapon capsule machines where you drop coins and collect toys. What makes TCGs so fascinating, then, is that they explore the whole range of the collectibles spectrum, showing how many video games ultimately – surprisingly – have roots in trinket dispensers. At the gamey end of the spectrum, there’s trading card game Kantai Collection. 'KanColle' began as a web game where you collected virtual 'cards'. You expanded your deck as you played, but you didn’t actually get any physical collectibles – it was definitely a video game. The characters on the cards, by the way, are simultaneously both teenage girls and battleships – it’s hard to believe no one thought of it before! Now we take one step nearer the gashapon via the pseudo-historical wargame TCG Sangokushi Taisen. Here, you do have physical trading cards, but the gameplay is sophisticated real-time strategy, sliding your cards around a table and seeing your armies move on screen. Buttons and gestures add further detail to the controls. The card art began with Chinese 'Wuxia' heroes wielding tremendous weapons with rippling muscles in lithe, swooping forms. The later decks went a bit pervy. World Club Champion Football resembles a Sangokushi Taisen cabinet – you manage a team by moving player cards on a magic table – but the gameplay is a bit less involved, and the sticker-collecting roots of its tie-up with Panini (of playground sticker album fame) tickle your 'complete-the-set' itch. Now we come to a format called ;Carddass;, which literally means ;dispense cards;, so you can see we’re about to ride the collectibles spectrum all the way down on this one. 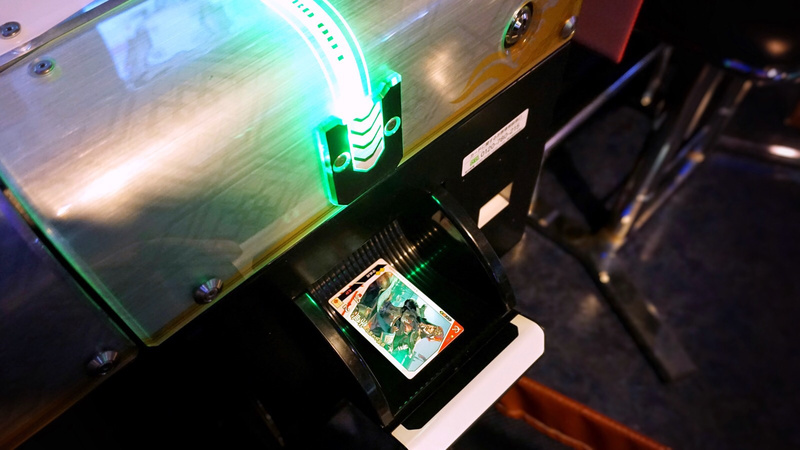 But first, we have the more modern 'Data Carddass' machines, which spit out smart trading cards which can be read by a sensor and added to a real video game. Titles cover a bunch of genres. First up, Gundam Try Age. Despite the childish look of the diminutive cabinet, Try Age is a mecha war game with a lot going on. It’s Mobile Suit Gundam trading-card-based realtime strategy, in which you have two card decks: suits and pilots. Three of each go onto the control panel, then you move them around and time button-hits to shoot stuff. Rad. The next Data Carddass, as we slip down a little further towards toy territory, is Dori Fes. Data Carddass Dori Fes is the arcade incarnation of Dream Festival, an idol-based, purpose-built, mixed-media money machine. 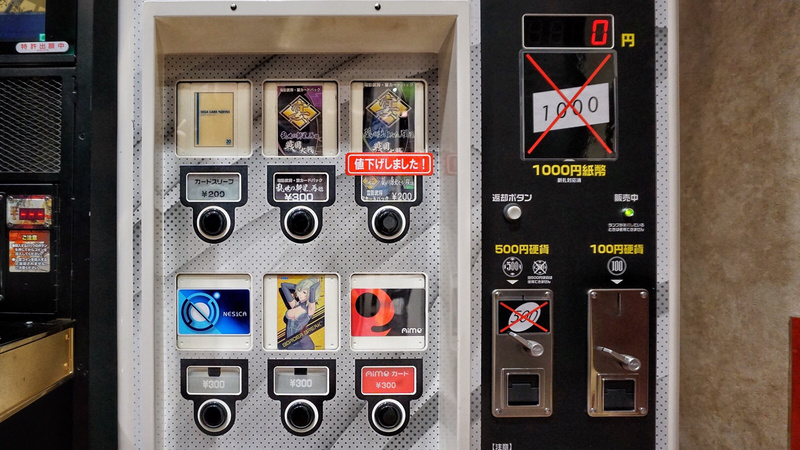 It does dispense cards, but that’s not all it has to offer: it’s also a rhythm game. Or whatever. Just gimme the cards. Puri Para is a compelling and thoughtful opus in Takara Tomy’s (no doubt culturally important) Pretty Series. There is a game in here, but you must be willing to accept that 'music-slash-fashion' is an actual game genre. It’s aimed at young girls – cute, smiley young girls, judging by the typical clientele you see playing it. Cute, smiley young girls, who happen to be giggling, mischievous, round-shouldered, male, about 40, with their trousers pulled up really high. Ahem. The original Carddass machines (no 'Data' here) began as simple card dispensers. 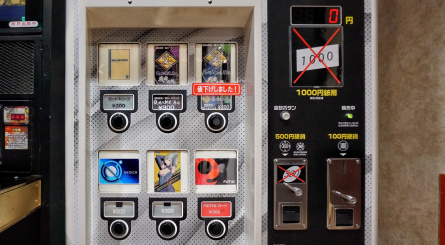 Bandai Namco actually positioned them as vending machines and so managed to get them into department stores and supermarkets, not just arcades. Even here, though, the collectibles spectrum keeps going, because some cards are just pretty pictures, but others are used for complex tabletop games. Gundam War, for instance, ran for many years, adding more and more decks and tangling into madder and madder complications. Aaaaand… SMASH! We’ve hit rock bottom. The most game-like thing about gashapon prizes is that most of them come in sets, and you get one at random, so you may need to buy (or trade) a lot of capsules to get them all. The lowliest of the low are just one-off toys – kiddy-silencing impulse buys that eke out their charm until it wears so thin it breaks. Then into the bin with them. To bring all of that back to the arcades, we now have a bit of cultural context for the collectibles fetish, even in non-card games like Border Break. TCGs, when you take the time to get to know them, are a fascinating offshoot of the arcade game family tree, with branches stretching into every genre. And they’re actually the clearest expression of the thinking behind the collectibles mechanics in most modern games. If riding the collectibles spectrum was the 'gasha' of the turning handle, this little nugget of insight is the 'pon' of the capsule hitting the hatch. So if you’re in a Japanese arcade and you meet a TCG who seems socially awkward or rude, please remember they don’t mean to be difficult. They just have a load of complicated stuff going on. Give them a break and you’ll be surprised how nice they are. Hey, Ryo Hazuki is into Gashapon, so they're fine in my book! "Toy capsules 100 yen each, huh? I should buy one." Actually, blind boxes for mini figures, mini posters, rubber keychains, badges, etc. are probably the next level gashapon (considering how much more they cost). I need to move to Japan. We Americans are just lame and don’t know how to have fun. The mentality here is still that kids play video games, adults aren’t suppose to. That’s why arcades here have died out. They need to evolve too. OMG I have a few students who play these, it gets hectic! And there are card shops in places like Akihabara in Tokyo or Nipponbashi in Osaka that dedicate as much as a quarter of their stores to these cards! I don't play them myself because my reading in Japanese... well... occasionally my elementary school kids correct my kanji XD But the games are very popular to be sure. Even the arcade in the local mall near where I live has a bunch of them. Also Kancolle is a crazy popular series with sooooooooooooooooooooooooooooooooooooooooooo much fan art online. And I thought street fighter was hard. Really fun read. I enjoy how the article comes full circle and ties this physical arcade collectible model to console collect-athons. While I was reading, I was having a hard time imagining myself getting in to any of the machines and their gimmicks, and then I remembered Korok seeds, and every Mario game since SNES, and I understood. Sometime, I take my kids to play games of chance/ticket exchange centers (Chuck E. Cheese, I crush Skee Ball), and they love getting the trinkets when we’re done. We call them major awards. They end up in the trash within a few days, but it’s about the memories. My city got a pinball hall and a barcade last winter. They both seem to be doing pretty well. The pinball is kind of mind blowing. I’ve known the guy who owns all the tables, and he’s been collecting for decades. It’s a nice mix of brand new tables, and butter smooth classics. The barcade is hit and miss. There are some real bootleg cabinets running questionable roms, but there are some legit cabinets as well. The beer selection is excellent though. BTW, "Puri Para" or "Pripara", has a Switch port of the arcade game. It doesn't have everything but it still has a good number of songs, it's called "PriPara: All Idol Perfect Stage"
Surprised not to see Pokémon GalOlé on this list. Also very negative about Gatcha. some are surprisingly good. I've got a Snorlax Gatcha machine that came out of a Gatcha, that dispenses mini prizes. It';s great. A lot of the cosplay Pikachu and Eevees are awesome too. I’ve been in a few arcades in Tokyo (and one in Hiroshima), and these card games are everywhere. Everywhere!! The entire Japan arcade scene is kind of daunting to an outsider. Lots of noise and insane crowds. Fantastic article! Thank you for this! I have some promotional cards I've gotten over time for the old Kamen Rider Ganbaride game and most recently one for a Lupinranger vs. Patranger game they have. 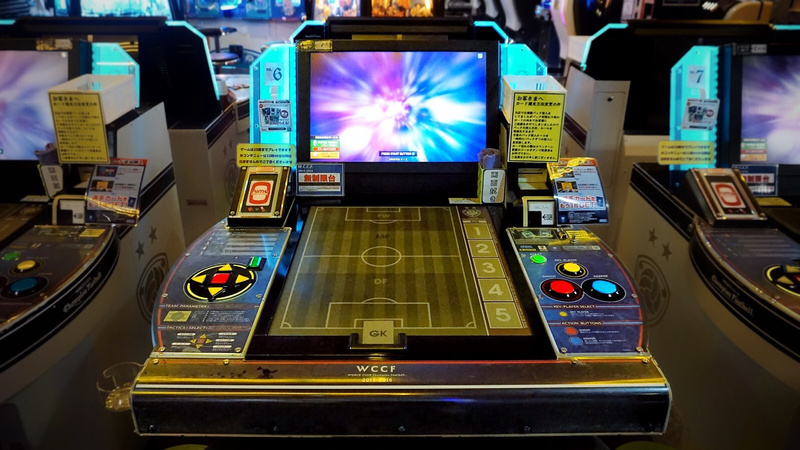 Not that I have a way to play them, as they were just giveaways with imported games and toys, but I do wish I could at least try out the machines. @masterLEON Thanks for the Shenmue reference. @MaSSiVeRiCaN Son't worry, Hollywood recently brought the rights to make Gundam movies. If they're as milked as Transformers are, soon everyone and their mom will know what Gundam is. 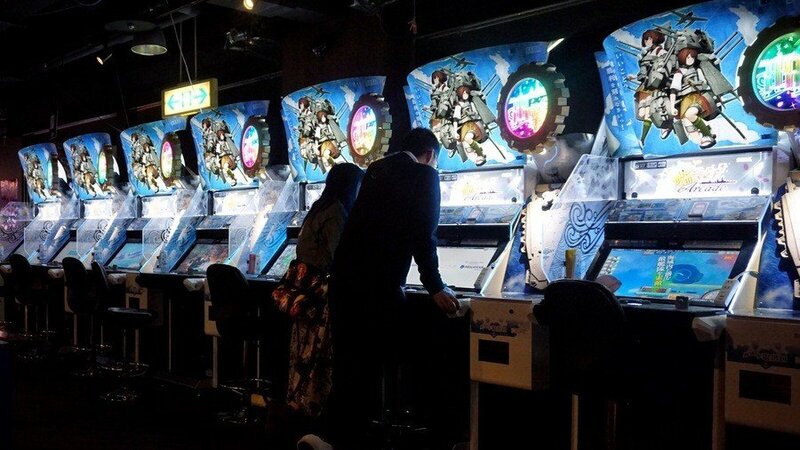 Wonder if YouTube have some gameplay, pics are nice but I would like to see these arcades in full glory. @MaSSiVeRiCaN I think that’s actually an interesting question. You can’t must buy a cabinet and import it and pop it in an arcade. There’s a whole context of network play, trading cards, and just the critical mass needed for team-based or trading-based games. 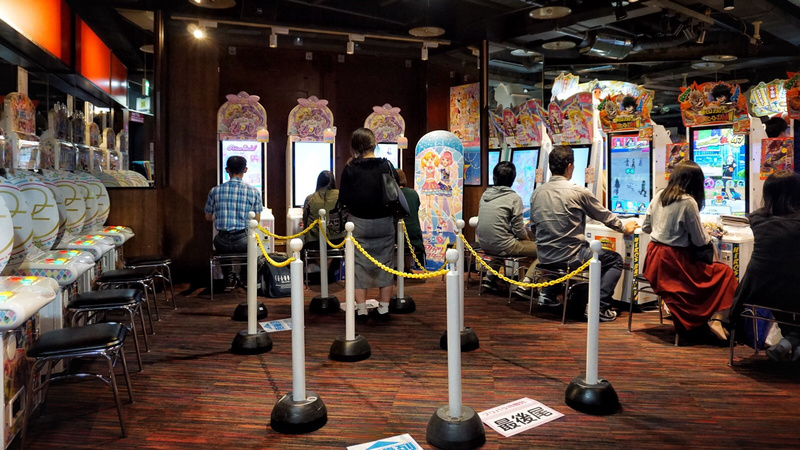 That sets Japan’s arcades apart but can also make them hard to get into. @Heavyarms55 It must be cool to see kids who get really into this stuff. I am very much a trading card tourist. The reading is a challenge, it’s true. Sengoku Taisen was my biggest adventure and I studied the 8 sides of instructions over lunch in Ōtoya for about an hour, then took half an hour to get through the tutorial mode. But once you know how to play, you’re sorted. Just have to read it once! @jn2002dk Hehe 😁 thanks! Are you listening guys? More like this, they say! @riChchestM Yeah, I was a bit mean to the gatchas, wasn’t I? I tend to get sarcastic about a lot stuff, but only if I really love it deep down 😄 Some top gashapon I’ve seen are a set of classroom desks and chairs (one type of chair and one type of desk) and a range of tempura sharks. I don’t know Pokemon GalOle so I’ll have to be on the lookout! @Francema Good idea. Here’s a video of Sangokushi Taisen! If you skip to 7:00 then you will see a battle. The mini map on the right shows how the player is moving their cards (green squares). ...now it all makes sense, I know why Nintendo thought the GBA e-Reader and amiibos would do so well..interesting read, thanks..now Hit Me!.. @Angelic_Lapras_King First appearance already came with Ready Player One so let’s see what happens lol. I'm not sure I understand. To me TCG means stuff like Magic: the Gathering. If it's like that combined with a coin-munching arcade machine... Dear God, and we thought lootboxes were bad. @SmaggTheSmug well, I’ve not played Magic: The Gathering, but I think arcade TCGs have grown out of tabletop ones in a similar way to how videogame RPGs came from the tabletop. @SH007ME Glad you enjoyed it. Yeah, I hadn’t thought of that but those concepts all seem to join up, don’t they? @Arcade_Tokyo lol, yes!! Don't worry! Fascinating topic, very interesting read. @patbacknitro18 Sorry I missed your favourite! I don’t actually know that one – it’s hard to keep on top of these games because there are so many and they take so much time (and money) to even start to get into. @Arcade_Tokyo Oh no its fine, it's still a good list. It's just that DBH is one of the more popular Card-Based Arcade games. Even though it's not even released in America it's still known by many here. And it's even getting an anime adaptation in July I believe. @Arcade_Tokyo - You’re welcome. That’s interesting about the lan cafes offering console rentals. I’m not sure about the legalities in the US, but Switch seems kind of perfect for that type of idea. Whenever I read your work, I’m always left wondering how the arcade would have evolved in other areas of the world. It seems like many of the games you’ve focused on, no matter what they’re doing/dispensing/scanning, seem to share a general massive multiplayer vibe in that, additional to in game achievements, there’s an entire culture surrounding the cards and figures the cabinets dispense; much like character levels and rare loot in MMOs. I’ve never played one, so I probably shouldn’t even comment, but I have a general understanding. There are still big arcades that never went away here in the US, but they were once everywhere. The new model seems to be the retro barcade. Depending on state law, they can be open to all ages during the day, then close to minors in the evening and become adult only. The focus is usually on early to mid 90s cabinets with an ample sprinkling of 80s classics. 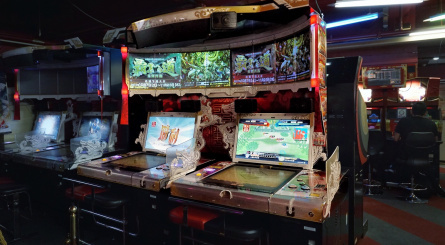 There are also multi level entertainment complexes featuring featuring food, drink, state of the art arcades, pinball, bowling, pool, skee ball, etc, but those completely lack the proper arcade atmosphere. Didn’t mean to respond with my own article. Just enjoy your work. I look forward to the next one. @ktej75 Pokémon. I don’t see a mario, zelda, metroid etc... tgc, but I can see what you said with Pokémon. Hope to be back soon on Nintendo Life. Meanwhile there’s my daily blog, Twitter and Instagram so come and say hi!